This is the most important value for this crusade. This is something that I am called to do. It was a very clear call of God that led me to get my finances in order, fire myself from Corporate America, negotiate myself a massive pay cut, move my family eleven hours and five states, and embark on this crusade at NewSpring Church. I am doing EXACTLY what I have been put on this earth to do. No doubts. No regrets. I have never looked back. I am burdened with a passion to help others take their finances to the next level. I can not escape it. I can not run from it. I can not shirk it. It keeps me awake at night. My vision/call in words: To help others accomplish far more than they ever thought possible with their personal finances. My current mission: Teach 100,000 people by October 2011. You can watch me share how I discovered my purpose in detail HERE. 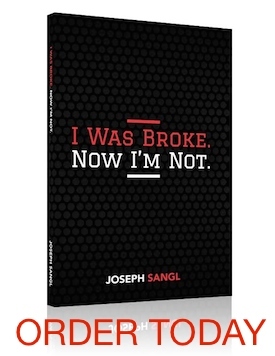 You can purchase Joe's first book I Was Broke. Now I'm Not. HERE. Volume discounts available for purchases of ten books or more.